On the blog today I am going to be discussing ‘Piercings’. 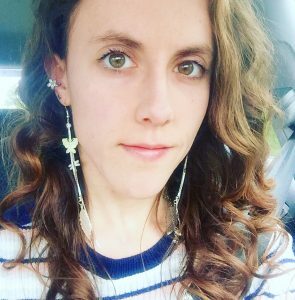 To wear multiple earrings is back on trend this year, and considering I already have that I have felt pretty fashionable lately. I was never a fan of my ears growing up, I had to wear glasses as well, so when I was eventually able to get my piercings done as a teenager I felt like I was finally happy with the way my ears looked. Putting earrings in them made me feel like an individual, and with the range of jewellery available nowadays, it’s no wonder so many people are getting things done. Whether you love them or hate them, piercings have been a cultural aspect of human life for thousands of years. The history behind them includes some mummified remains which were found to have pierced ears dating back to approximately 5000 years ago. Some body piercings go as far back as Ancient Rome. Facial piercings include African and American tribes, who used body piercing for spiritual reasons. More reasons for getting metal through your body in more recent decades include religious and self-expression. I have personally had mine done for aesthetic reasons. So what if you do love them, but you’re having trouble deciding what you should get, or where. Well in this blog post today I’m going to be explaining about my own experiences with piercings and the aftercare, and how I feel about it all now that I am much older than when I first decided to get my piercings on my body. My first piercing experience was when I was thirteen years old. I got my lobes pierced, and I wanted them done for a long long time. My mother had decided that you’re too young as a child to understand the implications of having something through your body that needs looking after and caring for. So I was told to wait until I was a responsible teenager. That time came and once the summer holidays started I was off to get my ears done. I had them done at Claire’s, and they pierced with a gun. If I had known this before hand I wouldn’t have gone there. It was painful, a real pinch, and they insisted we pierce with yellow gold, even though I had sensitive skin. My lobes didn’t heal within the six weeks they were meant to, and I ended up going back to complain. Luckily we spoke to a nice woman who suggested changing the studs to a sterling silver or a surgical steel, so I did this, and within two weeks my ears were healed. I kept earrings in them almost constantly for a year though, because my skin kept trying to heal over at the back. Even after all these years of having the holes, if I don’t wear earrings for a week they begin to heal. If you think about getting a piercing always go to a professional, either a piercing salon who specialise in all sorts of piercings, or one registered at a tattooist (bare in mind you may need to be eighteen on these premises). My favourite piercing is my navel. I had this done in the summer after I turned sixteen, and I had to beg my mother for over a year before she gave in and took me to have it done. A number of years ago the piercing was done in two parts, a piece of metal is pierced through the skin, and then the jewellery is quickly inserted afterwards. Now I hear they do it all in one smooth movement which makes it quicker and less painful. I won’t lie to you, it did hurt, but not to the point where you would faint, unless you’re particularly bad with pain. I felt a little light headed when I sat up afterwards, but that was more to do with your body going hot and into a state of shock because of what you just put it through. My piercing healed very well, and within a few months I was able to change the bar. I always wore a bar in it, because I loved it, and I found it to be a flattering piece of jewellery. You must continue to clean and look after your piercing in the months after it has healed to ensure it stays good. I love all the different kinds of jewellery you can purchase for a belly piercing, it’s so versatile. I haven’t grown much since I was sixteen, luckily, so the piercing hasn’t become misshapen, and I wear jewellery in it every day. All these years later and I still love mine. Here are a few pictures from over the years so you can see how it looks with varying bars in it. You can get metal bars, jeweled bars and even plastic ones, perfect for soaking up the sun because the metal doesn’t get hot. I do like the jeweled ones the best, you can easily match them with your outfits. Like I said this is my favourite piercing, it is most definitely a part of who I am as a person. 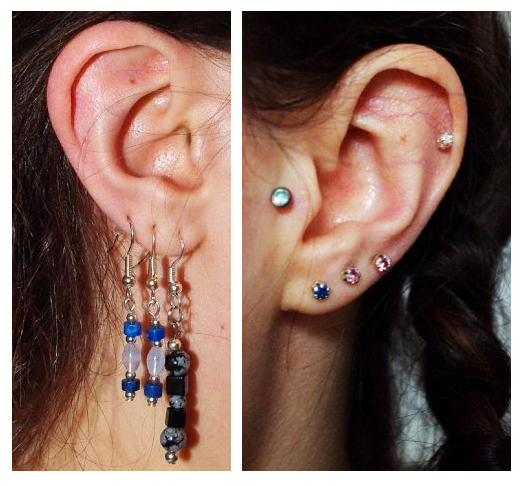 When I was eighteen I decided I wanted to get another part of my ear done. The helix or pinna part of the ear is done with a needle through the cartilage of a persons ear. Even though I looked after this piercing like all of the others, the trouble with any cartilage piercing is that if you knock it, get your hair caught in the jewellery, or even sleep on it for hours at a time, it can cause issues. This was the trouble with my piercing. I would often sleep on the other side and end up rolling over in the night unaware, and then that caused no air to get to my piercing. It took 18 months to heal completely, and although I really liked it, I would always remind myself of how long it took to be usable and wearable. After a year I made the decision to change the bar to surgical steel one with a flat base for the back of the ear, this was much better in terms of caring for the piece. I haven’t gone back to using any other jewellery in this piercing, I now only use flat backed bars where you can change the heads. I buy mine from ‘Body Jewellery Shop’ and find they have both excellent service and advice about types of jewellery. 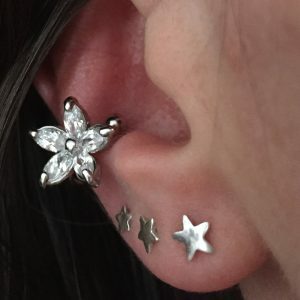 Here is a link to the stud that I currently wear in my helix piercing, I love this stud, and this online shop do a lot of variations to it, perfect if you want a large selection to find your individuality. Below is a recent image of my left ear, as you can see I’m wearing my heart labret stud in my helix and a simple plain bar in my tragus. I am wearing a trio of stars ranging in size in my lobes as well. Another piercing of mine is my Tragus. This was a decision that I took months to decide whether or not to go for it, because I have fairly small ears and I didn’t want to risk the piercing growing out, or it looking ridiculous. I went to a local piercing and tattoo studio for this one, and trusted their expertise. The lady was very thorough and explained to me the after care and complications that could happen with a piercing like this one. Even though it was a risk, I have had no problems with other piercings and decided to go for it. Years later and fully healed I’m so glad that I did it, although without any jewellery in it the hole is quite an eye saw, I don’t know what I will look like when I’m old if I ever have to remove it. But for now I always wear a bar in it. The piercing did hurt to have done, and it is a tricky one due to the placement so close to the face, however once your jewellery is in, it’s often a very flattering accessory and I love mine. There are lots of different jewellery available for it now, because it has become a very popular placement in the last few years. I had several lobe piercings in my late teens and early twenties. I love how multiple earrings look together. Here is a photograph of both my ears from way back in 2009 when I had recently had my Tragus done. 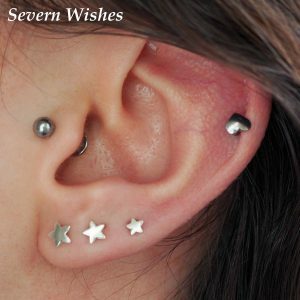 I love how with lobe piercings you can wear studs, or hoops or long earrings, or a mixture of all three. The possibilities are literally endless! I only wear surgical steel or sterling silver in my ears, but that is a personal choice. I know there are many choices on the market. So am I contemplating anymore? Not at the moment, although there are some I have seen that I would love to have. I love the latest jewellery that is available and I would love to have some piercings to compliment the ones I have now. But I do also have small ears and some types of piercings are not suitable for everyone. You also have to consider the healing time, if it will take longer than a couple of months will it be a problem for your school life, work life or for your health. Operations and scans and other medical situations often require you to remove all jewellery, so there are lots of things that you must consider before going ahead with a piercing. If you haven’t had one before, I recommend that you have a talk with your local piercing artist, and discuss the implications of pain, healing time and also whether or not your piercing choice is susceptible to growing out. I have been very lucky, but some peoples bodies reject their choice and this can lead to scarring. There is another choice nowadays that people can make, if they only want to wear these kinds of jewellery occasionally. You can get great fake pieces now that you just open and slide on, and then push closed just enough to hold on to your ear. Here is one earring that I own, that can be worn on the ear or other body areas too. Easy to use and light enough so it doesn’t hurt to be worn all day. Just ensure that you get a size that is appropriate for you. This flower one that I have is a little big but stands out nicely if you wear it with other floral accessories. Another choice for some is magnetic earrings too. I would love to try out some smaller fake piercings if anyone can recommend any, or if you have a product you can recommend me to review. I hope you have enjoyed reading about my experiences, if you have any questions I would be happy to answer any that I can, just leave me a comment below. Thank you for reading. This entry was posted in Fashion & Beauty, Jewellery, Lifestyle, Piercings & Tattoos by Sabrina. Bookmark the permalink. honest but your sites really nice, keep it up! I’ll go ahead and bookmark your site to come back later. Thank you that is so kind of you, I have lots of new and interesting posts coming up in October and November, I hope you enjoy them.